Kathryn Naftzger, 21, still remembers the shock of being diagnosed with acute lymphoblastic leukemia in April 2016. Over the course of her treatment she experienced good days, bad days and others that fell somewhere in between. She suffered fainting spells, fevers, pancreatitis, swollen cheeks and more. But she also enjoyed many milestones: enjoying a bowl of strawberries after months of being unable to eat fruit; being able to dress herself; learning to walk again; going out without wearing a mask; vomiting only once a week instead of every day. 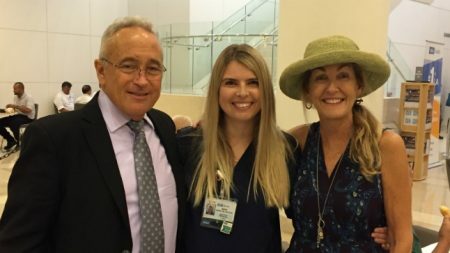 Richard Davies (left) and his wife Krystn Davies (right) reunite with UCLA Health oncology nurse Maria Quirch at the Celebration of Life on Sept. 12. Naftzger was one of 11 speakers who shared their stories at the ‘Celebration of Life’ event hosted by the UCLA Health Bone Marrow and Stem Cell transplant program on September 12 at Ronald Reagan UCLA Medical Center. The annual event, which began 16 years ago, brings together hundreds of patients with cancers of the blood or bone marrow who have undergone a bone marrow or stem cell transplant. They are joined by family members and medical staff who care for them. Mike Huntley, the husband of a patient, said the gathered represented a club – not one that most would have wanted to join, but a club nonetheless. “This club sees the world differently than people who are not in this club,” said Huntley, of Long Beach. Huntley’s wife, Mary, was diagnosed with acute myeloid leukemia in 2005. She went into remission, but had a reoccurrence in 2010 and died the following year. The Huntleys are still trying to give back. Frankie, now 17, is working with hospital staff to convert a meeting room into a ‘zen room’ for sixth-floor families to relax and meditate. UCLA Medical Center was one of the first medical centers to perform bone marrow transplantation in 1968. In 1973, the UCLA Bone Marrow Transplantation Program was formally established and since then, UCLA has performed more than 5,024 transplants. The program recently opened an Outpatient Stem Cell Transplantation Program, the first of its kind in Los Angeles. Instead of staying in the hospital for months, the program allows patients undergoing certain types of stem cell transplantation to receive treatment in an outpatient clinic. Richard Davies, 70, a multiple myeloma patient, was one of the first patients to receive a transplant in the outpatient clinic in January 2017. For patients who are hospitalized for their transplant, a unique volunteer program called the ‘Living History Project,’ helps bring a welcome diversion to their day. Jo Sue Whisler, a UCLA Health volunteer and writer, explained that she interviews the patient about their life, then creates a laminated one-page story with illustrations and presents it to the patient. Many patients expressed gratitude to the staff for helping them get through the often-isolating experience. Nicole Archer, was 30 years old and the mother of two small children when she started treatment for Burkitt lymphoma in April 2016 at UCLA Medical Center, Santa Monica. During treatment, Archer spent two to three weeks at a time in the hospital, missing her family that lived four hours away. She appreciated that the staff saw her as a person, not a patient. Visit www.uclahealth.org/transplants/bmt for more information on the UCLA Health Bone Marrow and Stem Cell transplant program. Enrique Rivero contributed to this article.